I always struggle to review these types of novels--these black lives matter, civil rights-esque novels. I often go into them expecting to be angry. I'm pre-angry before I even start them. Why? Because this is happening, still--today, and though the books are based on fictional characters--the story themselves are all too real. Jerome, was a kid--playing with a toy gun--when he was gunned down by a police officer. Mistaken for a "grown man," posing as a threat to--society, I suppose. The worlds demonizing and of black boys--depicting them as thugs, and villains is not new. But this impression is depicted in the body and the actions of a cop, in "fear" for his life, from a child--who was simply playing. It's this very idea that never sits right with me. I don't often know what to do with it, when the anger simmers deep within my gut--threating to manifest itself in the form of, God knows what. I often must take a moment, a deep breath and remind myself that it's simply fiction. That there are good people out there, when the line between fiction and reality blur. 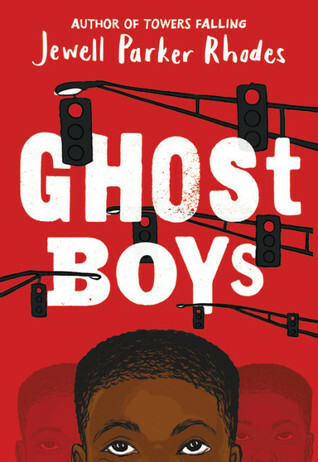 Ghost Boys is an eerie depiction of life, after death--specifically life after death by cop--by racial injustice--by misunderstandings, and ever-present fears. After the gun is shot, after the family mourns, after, after, after. The story is told in alternating perspectives, before (life), and after (death). To understand or to comprehend this type of death--you must first learn about their life. There was nothing particularly spectacular about Jerome. He was an average child--and I think that's far more impactful than making him, some super star. It humanizes his character--because he's just like you, like any other kid--with the potential to do anything. What was so stellar about the book aside from having the ghost of Emmet Till, is that it honestly reads so well. It's like this is happening--and you just want to understand it. I particularly liked that even though Jerome is now a ghost--with no understanding of why he was killed (but feeling the injustice), is that the author allowed his ghost to be visible to the daughter of the cop who killed him. It's almost poetic in a sense--because I would imagine that the bodies of the young black men, and older black men killed, sort of haunt the families affected. It also allowed for the reader to have another understanding of another side of the story. It wasn't only the perspective of Jerome's family--but also of the family of the cop who killed him, and how they deal with it, in real time, so to speak. My one complaint is that I would have liked to have seen Emmett Till's ghost have more of a voice. There's a part of me that just wants to understand his death--but that's an outrageous expectation, Jewell Parker Rhodes wasn't there. I just wanted to imagine it--even though, it would essentially hurt me. Aside from that, I think this novel is perfectly written for the age-range it is intended for. It's honest enough to not be a lie--but "soft" enough for a middle-grade aged child to understand. I think it's honest, and timely--sincere to its message, and important reading. I honestly, believe it will help younger children understand. It's something I would put in my classroom (if I were a teacher) --and have honest, open discussions over. It's the type of novel that will break down walls, barriers, and ignorance’s--with its honest and open words. Without comparison, this is a stand-out novel--in this range, and I'd recommend it to adults, and children alike. I just ask that as you read, you keep an open mind, and an open heart--because this is somebody's story--and most importantly someone's hurt. Books like this (where the events do happen) can be such hard reads but they are always so important too. It's important to remember things like this do still happen and that there is still a lot of hate and prejudices out there but it's always important to remember that even though there are a lot of bad things, there is still a lot of good and love out there too. I think the most important thing we can do as people, is try to spread the good and the love. ;) Wonderful review for this! !